I did this video as kind of a lark a few years ago, exploring the ways writers and story tellers are dealing with emerging climate science. Since then, there’s been an acceleration in the number of examples of an emerging genre, “Cli-Fi”. In some cases, climatic change is an essential theme of the stories, and in other cases, it simply is a fact – it exists as a background to the action, an accepted part of life in the future of the planet – as in the imagined “New Seoul” cityscape in “Cloud Atlas”. The Earth 101 conference in Reykjavik was specifically devoted to the ongoing task of processing the awesome new understanding that scientists are giving us about how the planet works, and what our future here may be like. Part of our work as communicators of this understanding is to change the story from one of helplessness and catastrophe, to empowerment and hope. promoting fiction and non-fiction books with climate themes. tables were set up. Customer reaction was positive, she said. Most of the books on the table are also available as e-books as well. Times, and The New Yorker. Sydney, Melbourne, Wellington and Paris? Is this a trend or just one-off events and photo opps in the UK? When Superstorm Sandy hit New York City last fall, the publisher Farrar, Straus and Giroux, like most everything else, totally shut down. It was a week before power returned to FSG, according to Brian Gittis, a senior publicist. When he got back to his office, he began sorting through galleys — advance copies of books. And one of them caught him off guard. 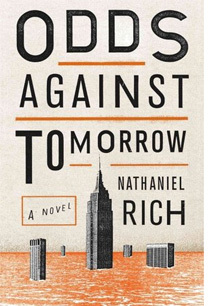 Its cover had an illustration of the Manhattan skyline half-submerged in water. “It was definitely sort of a Twilight Zone moment,” Gittis recalls. Over the past decade, more and more writers have begun to set their novels and short stories in worlds, not unlike our own, where the Earth’s systems are noticeably off-kilter. The genre has come to be called climate fiction — “cli-fi,” for short. 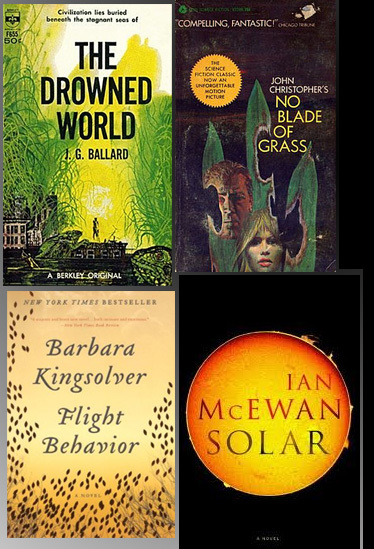 Of course, science fiction with an environmental bent has been around since the 1960s (think J.G. Ballard’s The Drowned World). But while sci-fi usually takes place in a dystopian future, cli-fi happens in a dystopian present.